White coat with black spots: almost every child knows “Lilla Gubben” the horse of Pippi Longstocking. But what about the popularity of spotted and speckled horses (so called leopard complex spotting) during the last millennia? Researchers found out that the occurrence of these horses fluctuated considerably in the course of history. Under the leadership of scientists of the German Leibniz Institute for Zoo and Wildlife Research (IZW) an international team of researchers genetically analysed the phenotype (appearance) of 96 archaeological bones and teeth of horses originating from the late Pleistocene to the Medieval Times. Although a considerable number of domestic horses from the early Bronze Age (2700 – 2000 B.C.) have been genetically identified with leopard spotting complex, this coat colour seems to have almost disappeared at the end of this period. One reason might be that homozygous animals (e.g. Appaloosa and American Miniature Horse) are night-blind in addition to the white coat colour. The ability to see is of great importance for communication, orientation, search for food and avoiding predators. Therefore night-blind animals have a barely chance to survive in the wild. In human care night-blind horses are described as nervous and timid, which are difficult to handle at dusk and darkness. About 1000 to 1500 years later the leopard complex again occurs increasingly. The coat colour was reintroduced into the domestic gene pool from numerous wild animals existing in those days. 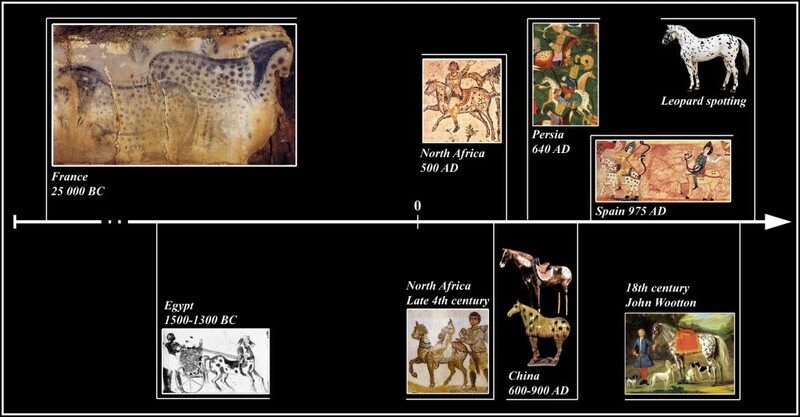 Different preferences of the horse breeders in the course of the millennia emphasise the importance of genetic diversity of domestic animals. In times where the original wild form of horse and cattle are long extinct and backcrossing hence is impossible, the modern animal breeding still target on a loss of genetic diversity. The decline in variability enormously restricts future changes in breeding aims and makes us dependent on only a few high-performance breeds. After the Iron Age a renewed upswing on leopard complex spotted horses was reported. “The behaviour of breeders and their preferences changed at that time as it does today” says Arne Ludwig from the IZW, head of the study. The changing interests in leopard complex spotted horses can also be recognised in Medieval Times, where they enjoyed a high reputation as paintings and text samples demonstrate. They belonged to the favourite animals of the nobles and were symbol of chastity. Also in Baroque period they were favoured, before they go out of date. Today spotted coat patterns occur in many breeds and breeders show an increasing interest in recent years. ”If the theory of the alternative selection applies then it can explain how genetic diversity in domestic populations could be preserved in spite of relevant selection for or against a certain characteristic. The problem in breeding nowadays is that we cannot go back to the appropriate wildlife species, because they are simply eradicated or the wild types vanished by selection. This has to be evaluated negatively for the gene pool of the today’s domestic animal breeds. The missing genetic diversity highly restricts the possibilities of breeding in the future“, comments Ludwig.